Rikkyo University is a private university headquartered in Tokyo. Common name is "Ritsudai". Rikkyo was founded in 1874 by Bishop Williams, a missionary, and was named Rikkyo University in 1907. In order to create something new, the curriculum has been designed to expand the student's perspective as a "fancy school" that can approach the essence in an environment open from restrictions. 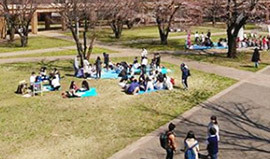 The university has 10 faculties in two campuses, Ikebukuro Campus and Niiza Campus, and is a university that can learn a wide range of knowledge. You can learn three well-balanced human resources: intelligence, sensitivity, and physicality, and learn from the philosophy based on Christian thinking. It is also possible to improve the level of education in the university-wide curriculum. There are also integrated schools such as elementary, junior high and high schools and genealogical schools.